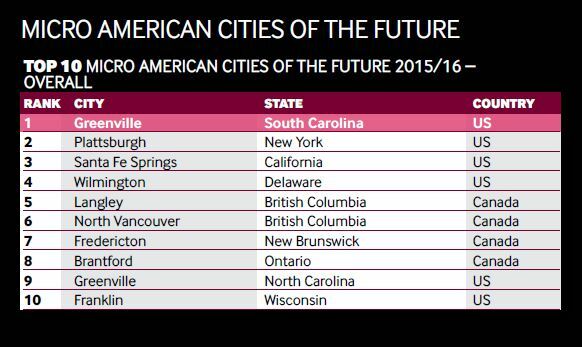 Last week, fDi Intelligence (a division of the prestigious Financial Times newspaper) released its report of American Cities of the Future for 2015 and 2016. The rankings compare data of economic and business potential for cities throughout the U.S. and Canada—and the report named Greenville #1 in the “Micro City” category! fDi defines a Micro City as one with a population below 100,000. The ranking measured success in six categories: Economic Potential, Business Friendliness, Human Capital and Lifestyle, Cost Effectiveness, and Connectivity. Greenville was named best overall in the Micro City category. We also ranked #1 in the Economic Potential category, and #2 in Business Friendliness.